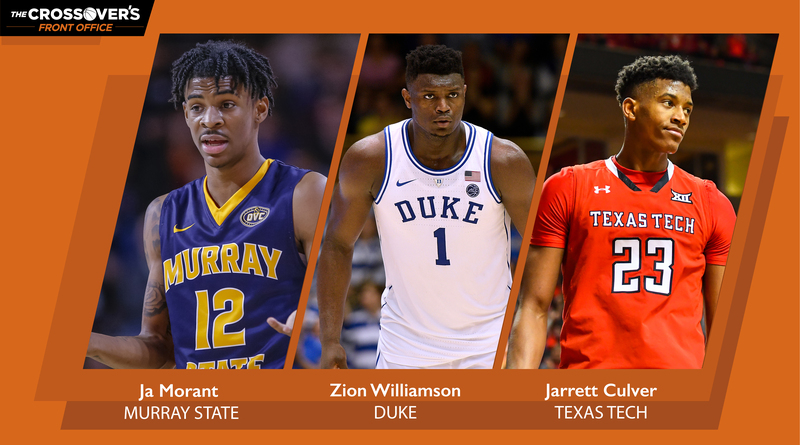 2019 NBA Mock Draft 5.0: Who Will Stand Out in the NCAA Tournament? 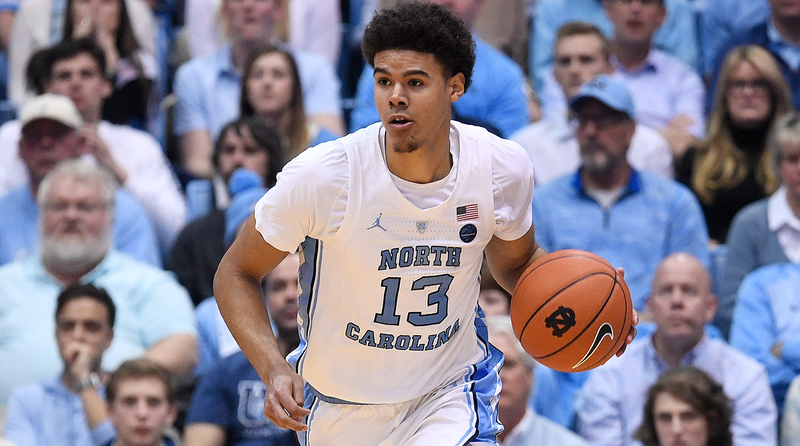 The NCAA tournament is finally here and The Crossover's Front Office provides its latest first-round projections for the 2019 NBA draft. Which prospects will leave a strong impression during March Madness? 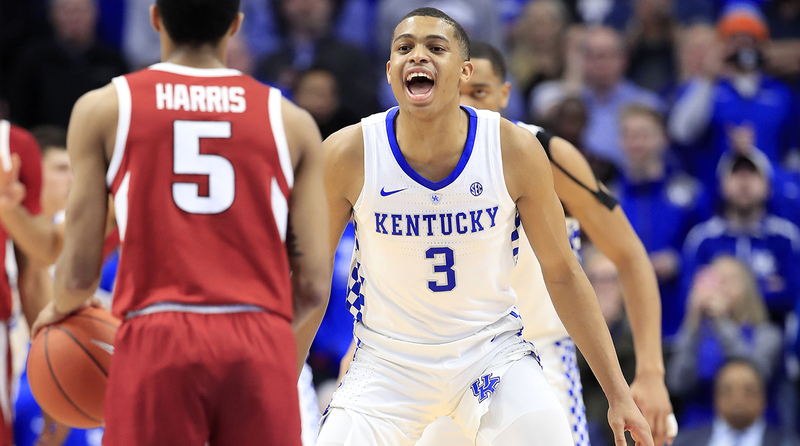 With a dozen or so games remaining in the NBA’s regular season and the NCAA tournament underway this week, the landscape of the 2019 draft continues to clarify in a very real way. We essentially know who the lottery teams are going to be, we know a large chunk of the prospects who will end up in the green room, and we can start putting the pieces together. We’ll revisit this after March Madness and expand to projecting both rounds down the line, but for now, here’s a sense of how the first round could shape up. As always, our mock draft paints a picture of what the draft might look like if it took place on a given day. For evaluations and rankings of the available prospects, check out our most recent big board, a fluid, comprehensive list of the top 80 players. The sequence of teams is based off of Basketball Reference’s playoff projections as of March 18, which can be found here. If the Knicks do in fact manage to win the lottery—for which they will have the best odds, but also the same odds as the two teams directly ahead of them in the overall standings—there will doubtlessly be debate about what they should do with it. If they can package the No. 1 pick and other stuff for Anthony Davis, that’s probably a legitimate consideration. On the other hand, Williamson’s hype has certainly grown to the point where one might be justifiably annoyed at the Knicks for not drafting him. Putting aside the flowery hyperbole, Williamson has some warts, but he also has a chance to be a generational player, and whoever wins the lottery will be remiss to not find out. There’s not much of an argument for anyone else at the top of the draft, and at this point, it’s just a matter of who gets a lucky draw. Yes, the Cavs have Collin Sexton, who also nominally plays point guard, but if they end up with this pick and are picking between Morant and Barrett, there is going to be some positional/stylistic conflict with last year’s lottery pick regardless. Picking Morant, who actually likes passing and should be considered the superior long-term prospect to Sexton (and Barrett) anyhow, would be more prudent if Cleveland were in this scenario. Morant has an chance to be a franchise-changing playmaker, though he will require a little bit of time, and whether the Cavs were to pivot from Sexton entirely or not, they would be justified in doubling up on guards. They could also look to trade down with a point guard-needy team, particularly if situated directly ahead of Phoenix. The Suns don’t expressly need Barrett, and this will be another position in the draft where teams might aim to try and trade down. When considering how to maximize the potential asset value of this pick, he seems like the optimal choice. Barrett is going to be able to score in the NBA, the question is just how efficiently and to what end. If he can play with and off of Devin Booker, Phoenix might have something interesting, but the Suns also have a ton of wings already on the roster. They desperately need a point guard, but reaching from here might be tough to justify. Culver is a pretty ideal fit with the Bulls, as a no-nonsense college standout who looks like a safe selection and can fit neatly into their mix of guys on the wing without cutting into anyone else’s shots. Chicago could also use a point guard, with Kris Dunn approaching restricted free agency as a less-than-inspiring long-term solution there. Taking Culver isn’t a home-run swing, but he’s one of the few lottery guys with whom you can walk away feeling somewhat confident that you’re getting a solid rotation player, and with how quickly he’s developed in college, there’s some upside here if he keeps working on his outside shooting. Atlanta is set with Trae Young and Kevin Huerter in their backcourt going forward, and with two Top-10 selections should end up in position to take a risk on Reddish. While he’s been wholly underwhelming for Duke this season and his issues finishing at the rim are particularly concerning, going to the Hawks would put him in a low-pressure situation where team and player can focus on specializing his skill set, rather than trying to turn him into something he’s not. If Reddish can just harness his ability more consistently, he has the tools to become a versatile 3-and-D forward. This would be an ideal situation for him. It seems like the Grizzlies are going to be unsuccessful in conveying this pick to the Celtics (which would help long-term, but involve finishing outside the bottom eight), and so they’ll be in position to go shopping for a long-term Mike Conley replacement. After Morant is off the board, teams are going to be debating between Garland and Coby White. Despite the fact he only played four games this season, the overall volatility of this draft is going to help keep Garland’s lottery stock somewhat solid. There are questionmarks attached with his physical profile, but someone will take a chance and try to develop him into a lead playmaker. His pre-draft workouts will obviously be key, noting the minimal body of work. There’s not a quick fix for the Wizards, particularly with John Wall injured, and they’d be justified in taking an upside throw in this range of the draft, positional fit notwithstanding. White has rapidly improved as North Carolina’s lead guard, and his size, projectable three-point shooting and potential to fit next to Wall and Bradley Beal in the short-term make some sense as a building block for Washington. He’s a prime candidate to break out in the tournament, and someone who has really helped himself over the course of the season. While Doumbouya is still a raw prospect, his season in France has been trending positively after his return from a thumb injury. He’ll be the youngest player in the draft, and his overall tools are going to make him worth a gamble. There is enough league-wide disillusionment with this year’s lottery that his perceived upside as a big, athletic forward and an improving shooter will matter here. Although the Pelicans’ decision tree is going to be contingent on what happens with Anthony Davis, they should be in position to find someone they like and develop him for the long-term. Doumbouya is still at such an early stage of his career, but has a chance to become a viable starter given time. It appears Hayes dodged serious injury in the Big 12 tournament, and he remains on track to be the first big man off the board. It’s hard to say what the Lakers might do with this pick given the heap of situational uncertainty going into the summer, but there likely won’t be an readymade NBA contributor worth reaching for in this range. Hayes is an appealing long-term project and unusually mobile for his size, and while he’s not especially skilled at this stage, it won’t be hard to buy in on him, assuming he’s healthy. If the Lakers end up having to make this pick for themselves, from a trade-value standpoint, Hayes makes a lot of sense. Porter quietly showed signs of progress toward the end of the season and continues to entice NBA brass with what many believe is star potential, although expectations are realistic and tempered. Some teams will stay away based on concerns about Porter’s maturity level and approach to the game, but others are heavily intrigued by his ability. Ideally, he’d land in a low-pressure environment with veterans around him to help with the transition. In what’s shaping up as an underwhelming lottery, don’t expect Porter to slip too much further than this. The Hornets need an infusion of talent, and could be a soft landing spot. While Minnesota could really use backcourt depth, there may not be a player worth reaching for who fits their style here. As an alternative, Little is still an interesting dice roll. He has not looked the part as a potential Top 10 pick, and Coby White has set himself apart as North Carolina’s most intriguing prospect, but in this range of the draft, it’s much easier to justify taking a chance on Little’s appealing physical tools. Although his feel for the game has lagged behind this season, he’s still just a freshman, and if he improves his shooting and commits on defense, he has a fairly clear pathway to at least contributing in the NBA. The ceiling isn’t as high as some thought it was, but the floor might be a little more palatable than currently perceived, as well. Orlando needs to add depth on the wing, although Johnson’s value is tied more to his intangibles and reasonably safe NBA outcome than tremendous upside. He’s intensely competitive, seems likely to keep improving, and would fit nicely with the Magic’s established collection of talent. Johnson obviously doesn’t have to become a star to justify a pick in this range, but his high-energy game might be exactly what Orlando needs. He might just be a role player, but he could be a very valuable one in the right situation. Barring any trade action, Boston is likely to pick three times in the first round. Hachimura fits their preferred mold as a tough, physically gifted forward still tapping into his full range of abilities, and would be afforded time to get up to speed. His strength, finishing and potential to improve as a jump shooter are all extremely appealing to teams, and in this range of the draft, he’ll be worth the risk. He’s made huge strides this season, although his hype may have peaked after beating Duke in Maui. Hachimura and Gonzaga’s other prospects would all be aided by a Final Four run against top competition in the next couple weeks. Scouts we’ve spoken with have been souring on Langford, who turned in an incomplete freshman season, to say the least. There’s a real chance he could slip out of the lottery entirely as the predraft process shakes out. His appealing frame, strength and athleticism will be enough for someone to take a chance on him—a development-oriented organization like the Heat could be ideal—but Langford is a limited off-dribble player and below-average jump shooter who is far from ready to help an NBA team at this stage. Some NBA evaluators have floated that he really could use a second year of college, although that possibility seems unlikely. Langford will need to repair his stock in workouts and interviews, and convince teams he’s worth the investment. Washington has gotten the most out of his sophomore season and should safely find himself in the first round. He’s been wearing a boot going into this weekend’s tournament games, which could be of some short-term concern, but at this point, everyone is aware of what he brings. His rebounding, finishing and shot-blocking skills in a mobile, athletic package should make him a future rotation player, with potential to get stronger and hopefully become a legitimate NBA floor-spacer (he’s shooting 41% from three, but an average 67% from the line). He’d fit the Nets’ preferred high-IQ mold and give them depth up front. The Pistons could desperately use more size on the wing, and Okpala offers some untapped upside, although he finished out the year struggling and is at an interesting juncture. If he comes out, he’s likely to be a first-rounder regardless based on his build, ability to attack the rim and hit set shots. It was an uneven year for him despite the Pac-12 talent level being down across the board, but Stanford struggled a bit on whole, as well. Guys with his type of tools tend to fare well in the draft process, and as someone who had a late growth spurt and is still getting used to his own body, Okpala still has plenty of room for long-term optimism. In this scenario, Boston could try and stash Bitadze another year, but he’s shown he’s ready to come over now and has produced impressively all year in Europe. Granted, he’s a slower-footed big who fits a more dated NBA archetype, but he’s plenty skilled and a bit more athletic than he gets credit for. With statistics, feel and overall game well ahead of his age curve, expect a team to invest in the first round hoping to land a future rotation piece. Porter has always been an ideal fit for San Antonio’s dual-big looks, and his unusually productive freshman season still resonates with people. He needs to show up to workouts in peak shape after missing the season with injury, but his mature style of play gives him a good chance to find a niche as a frontcourt piece who can pass and knock down shots. Analytically-minded teams will also place a premium on his skills. Most have come to realize that Alexander-Walker profiles best as a two who can play off of a downhill-oriented playmaking ballhandler. With that in mind, he’d be a nice fit playing off of Russell Westbrook, which would create opportunities for him to attack defenses off ball rotation and remove the pressure to anchor possessions. Alexander-Walker isn’t very explosive and has to keep working on his body, but most scouts are comfortable with him in the 20s, and he has the type of instincts as a passer and shooter to slide into what has become a valuable NBA role. Fernando is a fairly bankable first-round pick, given that very few bigs with his physical gifts who play and work as consistently hard as he does flame out. Utah could use more depth up front, and he can already keep up athletically in the NBA. Maryland hardly ever puts him in pick-and-roll situations, but Fernando will be best deployed as a ball-screener and energetic presence on the interior, and he’ll take up space and should be able to make a positive impact. He’s continued to set himself apart from a glut of centers in the middle of the draft. With the long-term future of Boston’s backcourt somewhat uncertain, adding Dort to the mix would provide some long-stability. He can be dynamic defensively and should be more effective when asked to do less as a scorer. His shooting struggles and overall skill level needs to improve, but people are comfortable with him as a floor-based pick—there aren’t many players with his heavier body type who are as athletic as he is. Dort is sort of a half-empty/half-full player, depending on what you value, but he has the right type of profile to succeed as a role player. Portland has tried a lot of combinations around Damian Lillard and C.J. McCollum over the years, but they don’t have an elite catch-and-shoot guy like Johnson on the roster. After watching him knock down big shots all season while sustaining an absurd 46.5% clip, there’s a real chance Johnson ends up as a first-round selection. If he’s this consistent an outside threat, he’ll be immensely valuable to have under team control long-term, defensive concerns aside. For playoff teams looking to fill that need, he’s squarely on the radar. Herro overcame a middling start to the year to finish the regular season as Kentucky’s second-leading scorer, and he did that while playing the largest share of minutes, yet finishing fifth on the team in usage, according to KenPom data. His efficiency throughout has been impressive, his three-point shooting projects cleanly, and he’s been more helpful defensively than expected. Herro’s potential to put the ball in the basket at all three levels has had him on the first-round cusp all year, and at this point, he’s somewhat safely in it. He’d be a viable fit for Indiana. Although his skill set is somewhat unorthodox, Horton-Tucker has maintained a high level of interest with teams and is one of the best on-the-move playmakers in the draft. His ability to pass and score creatively makes him a worthwhile flier, coupled with the fact he’s one of the youngest players in the class. There’s concern from teams about Horton-Tucker’s body type and defensive contributions, and his shooting has to improve as well, but there’s untapped ability here that offers intrigue. It’s fair to assume Thybulle’s extremely impactful defensive acumen will translate from Washington’s 2-3 zone to the NBA. His length, quickness and instincts allow him to dominate passing lanes and cover lots of ground, and that potentially elite skill has legitimized him as a first-round option. However, he can still be a zero offensively, where he is almost reticent to score at times. Still, being a somewhat projectable three-point shooter and plus athlete gives Thybulle enough of a skill set to flier here, particularly for a team like the Sixers that simply needs him to space the floor and guard. Bol may not slip all the way out of the first round, but it’s certainly possible he gets close if no team is inspired to assume the risk, particularly at a replaceable position. His finishing, shot-blocking and unusual ability to shoot from outside at his size makes him tantalizing, but his rail-thin body type created issues at the college level that might be exacerbated within the physicality of the NBA game. At the end of the day, his foot injury just adds to the risk. A team like the Nets with an extra first-rounder could afford to see what happens. After a pair of terrific games against Tennessee this month, Okeke looks to be peaking at a good time, with Auburn having won 10 of 11 games going into the tournament. He’s the type of positionless forward Golden State tends to favor, capable of knocking down open threes comfortably, contributing on the glass and defending on the perimeter, with quick hands that help him force turnovers. Okeke is a strong candidate to test the waters right now, with a shot at the first round if all breaks correctly, and has a nice amount of long-term potential if he can put things together consistently. There’s a good deal of buzz surrounding Queta right now, and he took advantage of his platform at the Mountain West tournament, anchoring the Aggies to a title and their 18th win in 19 games. He’s predictably foul-prone given his body type and overall rawness, but has legit NBA length, moves his feet well and has some tantalizing rim-protector upside. The Portuguese native has shown more than enough to justify a selection, and while he might develop more with another year in school, there’s just enough mystery involved with his profile to think that this might be a good window for him to test the waters. Queta could rise quickly this spring. With an ideal role-player skill set, Nwora deserves to be on the late first-round radar right now, having proven he can make tough shots under pressure, rebound and handle on the perimeter. He progressed in a major way this season, reining in some of his shot selection to the benefit of the team and simultaneously becoming indispensable for Louisville. If the Cardinals can string together a couple of wins this week, the hype should build further. He’d be great for the Bucks, who need multidimensional floor-spacers to fit their style of play.